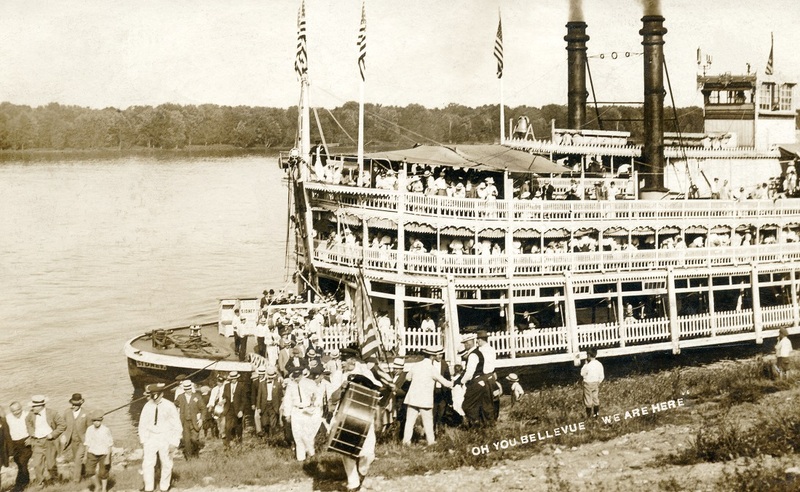 Detail from a charming horizontal format photo from La Crosse of the COLUMBIA with pilot, crew, officers and passengers visible on board as she heads toward us on a glassy smooth river. Built at Muller Boatyard, Stillwater, Minnesota 1900; constructed from the former rafter PAULINE; Captain William Henning and Captain Frank J. Fugina. 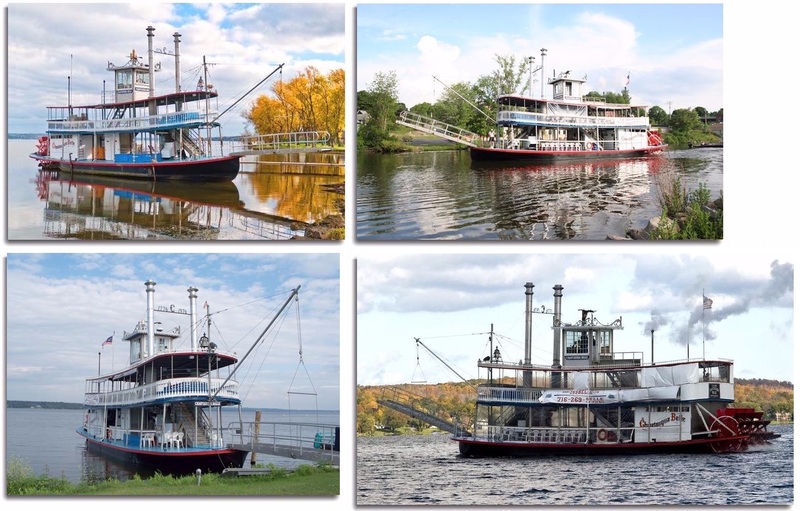 On Chautauqua Lake at Mayville, New York you can cruise aboard the authentic sternwheel excursion steamboat CHAUTAUQUA BELLE - Way's Packet Directory Number 0981. Attached 4 images composited from online sources. We would be glad to credit the photographers if they contact steamboat.com. 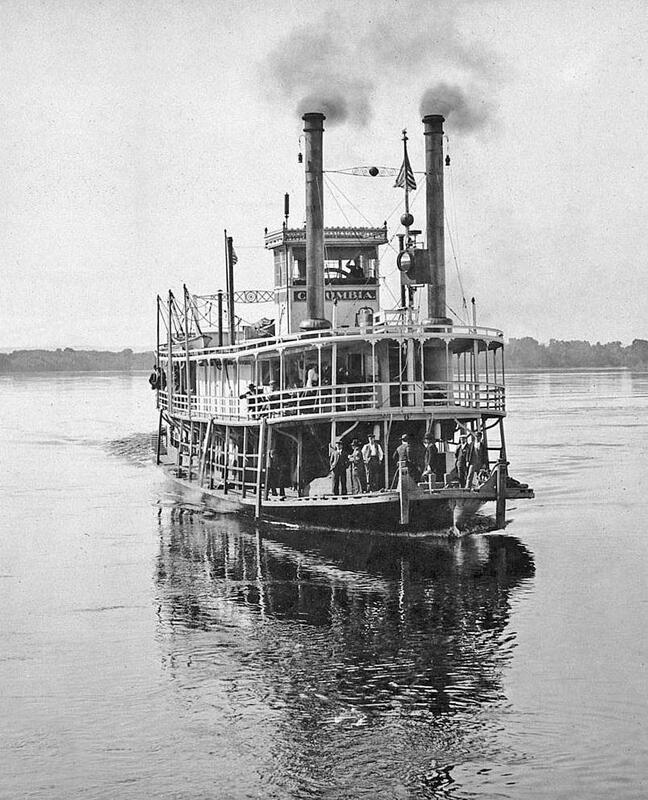 The CHAUTAUQUA BELLE's style is beloved to folks who associate her design by Alan Bates with steamboats on the Mississippi River and tributaries. She could be easily modified to play a period steamer in a movie by adding a mock-up of a "cabin" on the boiler deck under the pilot house and a stage/gang plank without railings along with some other enhancements. 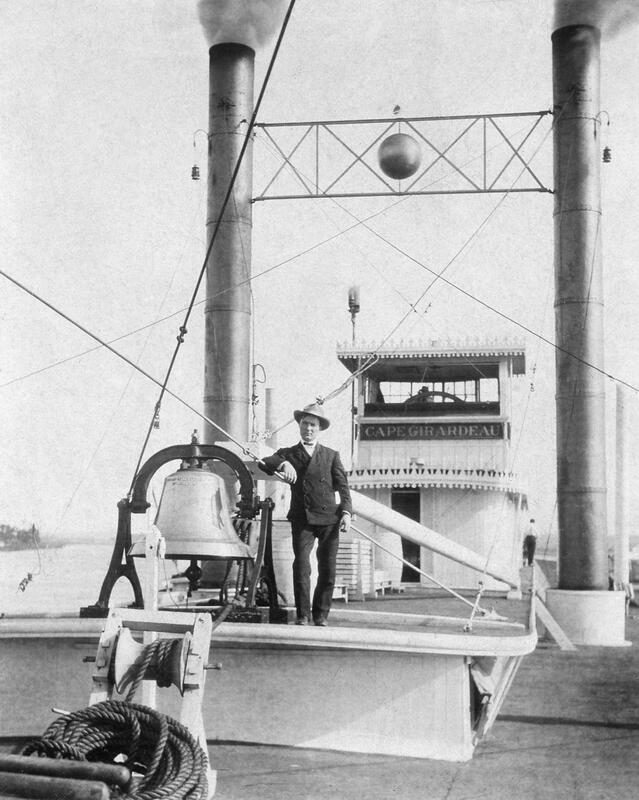 Novelty photo of Sacramento River steamer J.D. PETERS helping to reclaim flooded Mandeville Island in the San Joaquin River in 1938. Included is a detail from a La Crosse photo of the J.D. PETERS alongside the CAPITAL CITY at Stockton, CA. 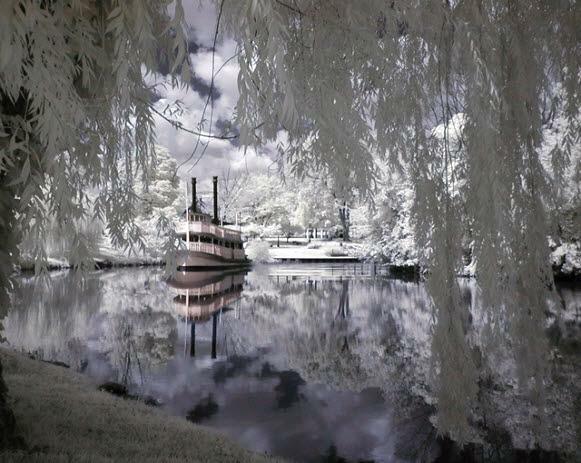 A new use has been found for old steamboats - - - that of drying out inundated islands. High flood waters in the Delta of the San Joaquin River broke through a levee to flood Mandeville Island, which is now below river level. 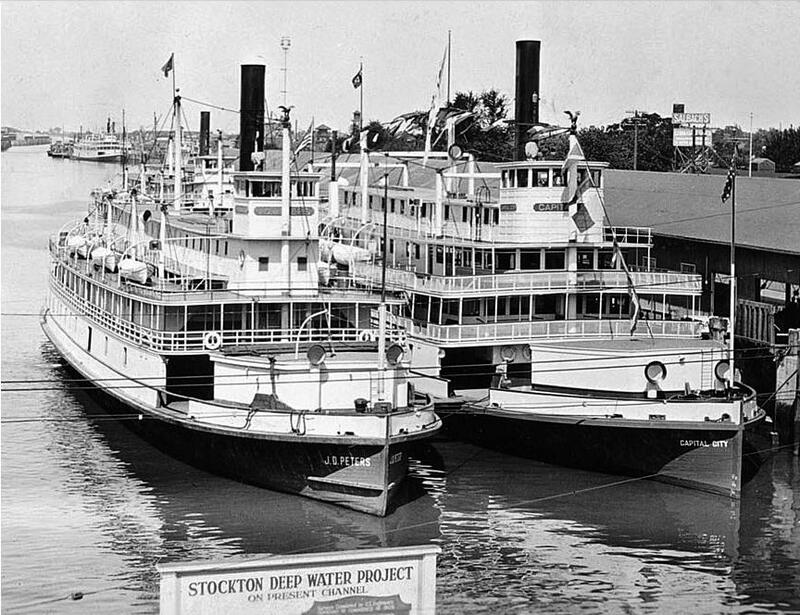 To dry off the land, a fleet of 4 river steamboats including the J.D. PETERS (built in 1889) in this photograph, were taken inside the island area through the levee break. The levee was sealed and the old old steamers backed up so their stern paddlewheels were positioned in front of trough-like flumes over the levee. With their boilers going and paddlewheels churning and the boats secured so they can't move, they are raising the water into the flumes which flows back into the river. Meanwhile the island area, which is 1600 flooded acres in extent with water 10 feet deep, is expected to be reclaimed in time for fall planting. When the island is dried out the once proud river steamers will be used as bunkhouses for ranch hands. 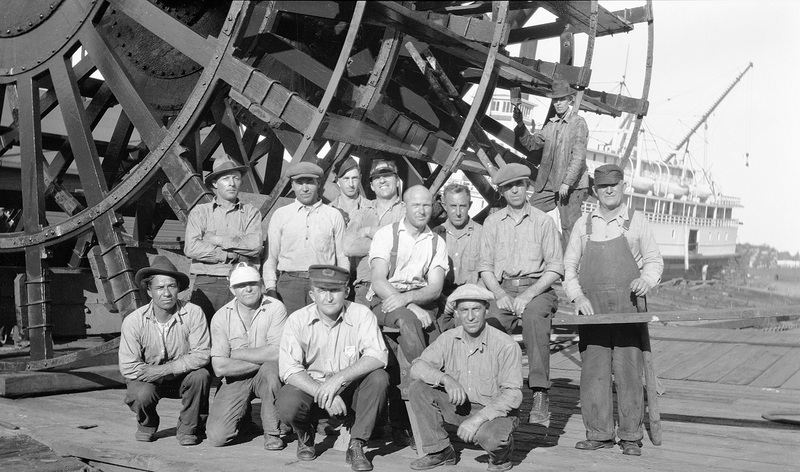 The crew of the sternwheel Sacramento steamboat J.D. PETERS (which was built in 1889) taken in October 1930 at a shipyard very likely located on San Francisco Bay. Postcard with August 19, 1916 postmark. The name on the hull below the deck at the bow says SIDNEY, big as life. We've got an old newspaper ad from a Hannibal paper for an excursion for her on one of the new pages. Note the musician with the big bass drum in the left foreground with some fellows following him up the river banks who are wearing the same uniform, probably band players also. Four U.S. flags are on flag poles aboard the SIDNEY and at least one flag is being carried ashore among the passengers who may be bound for a picnic at a riverfront park. It addition to the folks disembarking there are plenty of passengers still on the boat. 'appy 'oliday! The SIDNEY was commissioned in 1911 and remained in the Streckfus fleet under that name until 1924, when it was renamed the WASHINGTON. This was the first boat to feature a New Orleans band on the river, and it helped to spread the word about the special talents of Crescent City musicians. Fate Marable had formed a band of fellow Kentuckians in 1917, but he later recalled that while they "played real nice, they could not compare to the New Orleans boys." The Streckfus excursions ran from New Orleans to St. Paul, Minnesota, allowing numerous opportunities for patrons up and down the Mississippi River to hear what these players had to offer. Thus, musicians in places such as St. Louis, Missouri, and Davenport, Iowa, gained exposure to New Orleans style music, although it was confined to some extent by the guidelines set down by Marable and Captain Joe Streckfus. Even so, musicians and dancers alike could tell that New Orleans players were somehow different. As Captain C. W. Elder claimed, "None of the others had what was called good solid beat rhythm music with the Dixieland flavor." Attached lucky find on eBay . . . an original "cabinet card" photo of the CAPE GIRARDEAU 3.70 x 4.60 inches. The man standing next to the bell was not identified. The focus is a bit soft on the pilot house but the bell and stacks are sharp. Built at Madison, Indiana 1851, as War Eagle; rebuilt at the Carondelet ways, St. Louis, Missouri 1901 and renamed Cape Girardeau. She had red-painted smokestacks and was known as the "Red Stack Cape." Owned by the Eagle Packet Company, she ran regularly in the St. Louis-Cape-Commerce trade, Captain Willam H. "Buck" Leyhe master. She sank while en route from Commerce to St. Louis, Missouri, after hitting a hidden obstruction and was lost at Turkey Island 50 miles above St. Louis, Missouri July 11, 1910. The total loss of cargo was estimated at $60,000; no insurance. A dinky little snapshot from a scrapbook 2.80 x 3.70 of the S.L. ELAM at a landing on the Red River or the Ouachita River. Whoever wrote in white pencil under the photo on the black page in the album probably hadn't heard the word "paddlewheel" before because they described it simply as "Old Time Propeller"
Originally had a patented Kidney boiler which was replaced in 1915 with three return-flue boilers. Named for Judge Elam of Natchez, Mississippi. She ran on the Red River at first and later she ran on the Ouachita between New Orleans, Louisiana and Camden, Arkansas. In December 1915 she snagged and sank in the lower Red River. She made one trip, Pittsburgh-Cincinnati, under the name S.L. 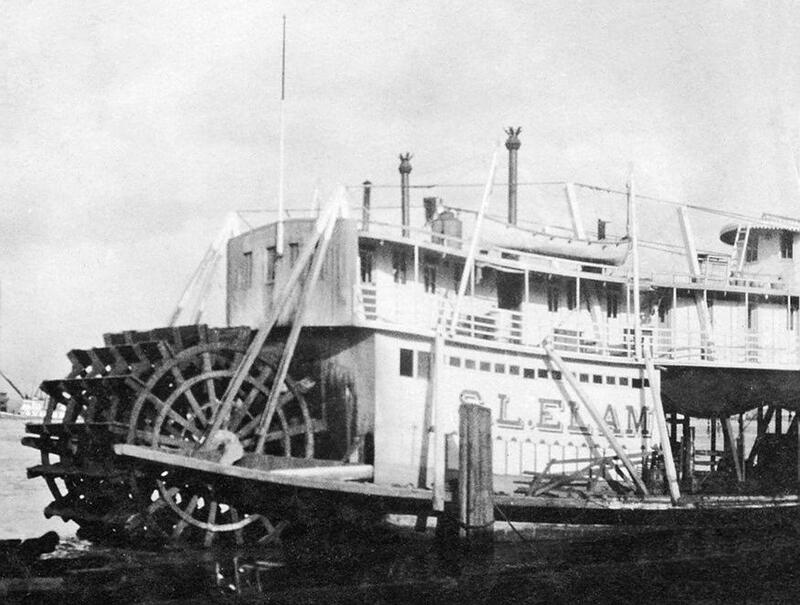 ELAM after being sold to the Liberty Transit Company in 1918. 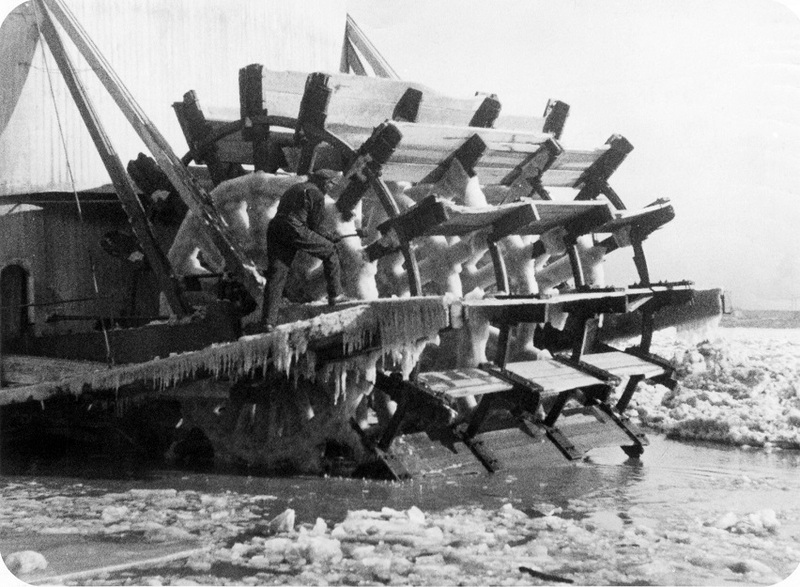 Sternwheelers were not made for Arctic use but this one is making the attempt to navigate the ice choked Mississippi river before navigation became impossible. The photo shows the workman chopping ice from the paddlewheel as the river boat attempts to ford her way thru the ice. One of the stranger "caught in the act" photos of a sternwheeler from Murphy Library. 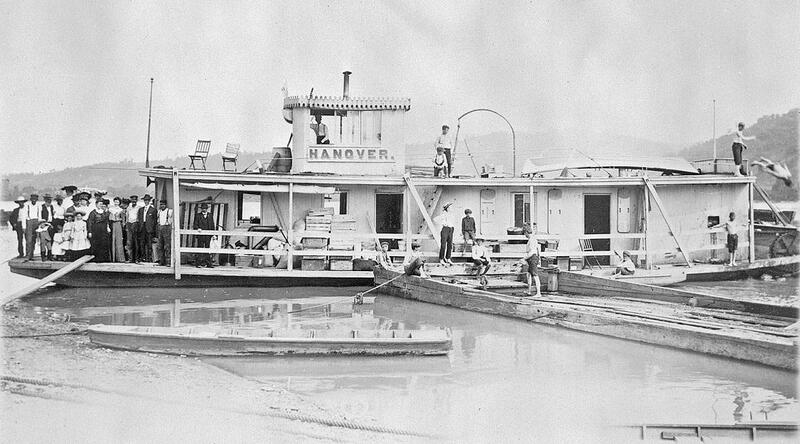 This is the gas boat HANOVER on the Alabama River. Looks like the diving boy just above the sternwheel could have been launched from the boat with "help" from a "friend." A knock out punch delivered from behind? Note that 3 of boys in the middle of the boat were watching, so were witnesses to that "dive." A head first dive that close to shore could be dangerous if the water was too shallow. The HAVOVER had a lot of style for a little gas boat. Charming capture of bygone days. Undated photo, possibly early 1900's. 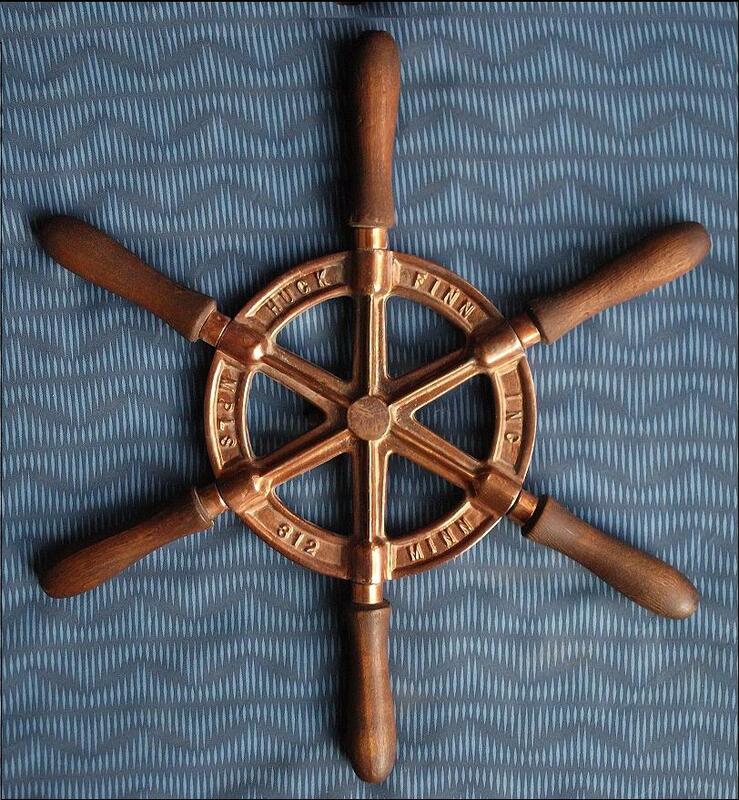 Photo of mini-pilot wheel manufactured by HUCK FINN Incorporated of Minneapolis Minnesota. This would fit on a pontoon boat or some other small craft. Measures 15 inches across, got it on eBay from a dealer in Niceville, Florida . . . the town's name would lend itself to be a title for a T.V. series about a superhero's boyhood hometown. The metal portion originally had an aluminum finish, I had it copper plated, gave it a patina & re-stained the handles. Want to mount it on a circular wooden plaque for display eventually. The company was produced a number of plastic/polyethylene products, covering a variety of industries. Huck Finn patented a plastic beer keg, which was designed to reduce the weight of the keg compared to traditional metal kegs. 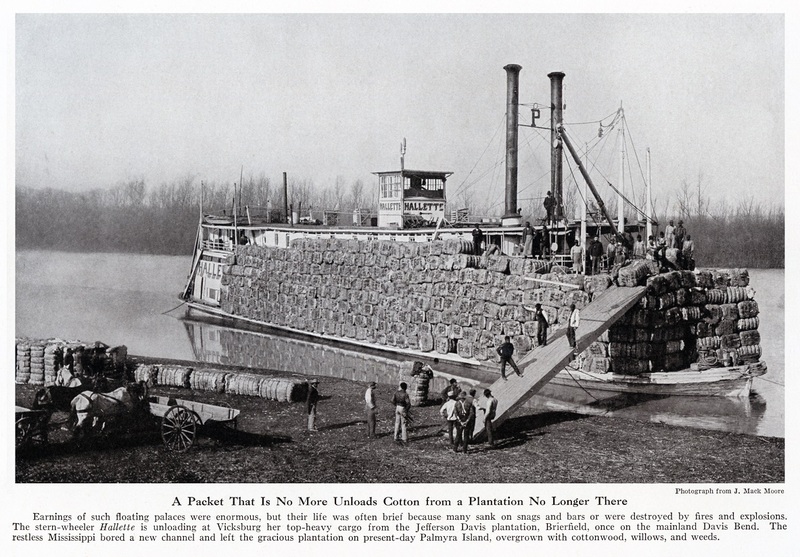 The company also manufactured pontoon boats (one was known as the "Idle Hour")for consumers, featuring the company's patented pontoon system." Photo of mini-pilot wheel manufactured by HUCK FINN Incorporated of Minneapolis Minnesota. This would fit on a pontoon boat or some other small craft. Measures 15 inches across, got it on eBay from a dealer in Niceville, Florida . . . the town's name would lend itself to be a title for a T.V. series about a superhero's boyhood hometown. 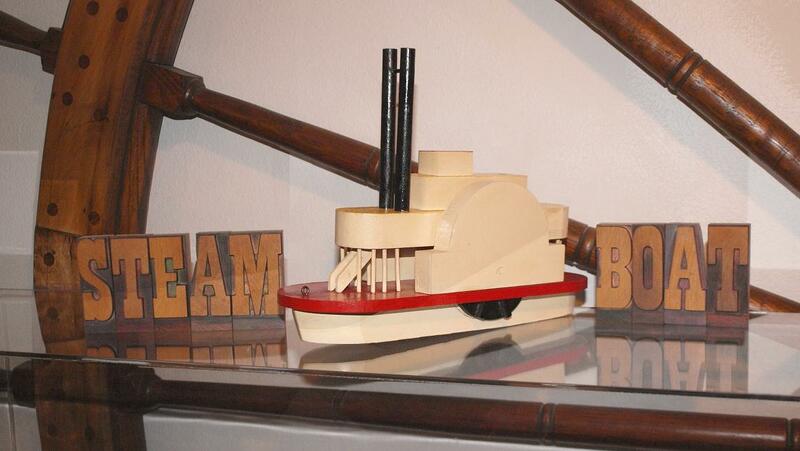 Concept of a sidewheel steamboat reduced to basic shapes as a child's pull toy, hand made of wood and painted. Circa 1970's. 12 1/4 inches long, 9 1/2 inches tall, 4 1/2 inches wide. Proportions of components in the model relied on "artistic license" rather than being "true to life." I posed the toy with some wooden display type, flipped the photo into a mirror image so the lettering would read correctly. Toy is symmetrical so it wasn't compromised when it became a "reflection." Pilot wheel from the PEERLESS against the wall behind the objects. Sadly, the Suwanee which was in service at the Henry Ford Museum's Greenfield Village since 1930 was dismantled and scrapped in 2011. Prints are available from the photographer at his site: creativ-iphotography.smugmug.com.